Every great man that I know has an undeniable love for three things: his mama, his country and his dog. Hunters have long used canine companions to assist in locating and retrieving their targets and although there are hundreds of breeds that can be trained for hunting, five of those are ranked as the most popular hunting breeds in America. Not only the top ranked sporting breed, Labrador Retrievers have been ranked as the American Kennel Club’s most popular overall breed for a number of years. 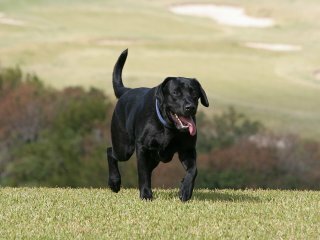 Typically energetic dogs, labs are eager to excel and please their owners, giving the breed high marks for trainability. Webbed feet and an otter-like tail give Labrador Retrievers an edge in the water, while outgoing personalities and lots of intelligence make these dogs not only stellar hunting partners but superb family members as well. Typically trained as bird dogs, Labrador Retrievers have a soft mouth grip, allowing them to retrieve prey without causing damage. Aside from retrieval, Labs are often trained as trackers or pointers, proving their adaptability and willingness to learn. The average size of Labrador Retrievers can vary widely, although the breed standard places the average breed weight between 55-75 pounds. Regardless of whether your lab is black, chocolate (brown) or yellow, the bottom line is that these dogs are awesome. And yes, I do have one sleeping on my feet. I’m biased. I admit it. Best recognized as bird dogs capable of performing in water or on dry land, German Shorthaired Pointers are also versatile tracking dogs for land animals including deer and raccoon. Clever and protective, German Shorthaired Pointers are also willing to please and eager to be included in the activities of their human counterparts. A short, dense coat paired with small webbed feet and a sleek build make the breed swift both in and out of the water. A keen sense of smell gives German Shorthaired Pointers stellar scenting abilities. While the dog does not flush out prey, upon locating it will freeze and point as a queue to its master. Weighing in at an average of 55-70 pounds, German Shorthaired Pointers are athletic and available in variations of liver, white and roan coloring. This breed is a great match for hunters with an active life at home to provide plenty of exercise and mental stimulation. Originally bred as elite bird dogs, English Setters are staying true to their roots as one of today’s most popular gundogs. Top notch scenting abilities lead this quick, quiet working dog to locate prey and crouch while waiting for their hunting companion to catch up. A normally friendly, relatively calm demeanor makes for a vivacious hunting dog and affectionate, relaxed companion at home. Longer, flat coats display feathering on the tail, underside and ears of English Setters. The average breed weight is between 50-80 pounds, although dogs bred for hunting and field work are often on the smaller side. English Setters do not tire easily, making them ideal for long days out in the field, but requiring adequate exercise during time at home. Intent on using scent to locate prey, Coonhounds can often be found with their noses to the ground, on a mission. With six varieties of the Coonhound available to hunters, it is believed that the breed originated by crossing a bloodhounds and foxhounds, of which both breeds are notable trackers. Best utilized to track land mammals, Coonhounds are reliable trackers of opossums, raccoons and often larger animals including bears and mountain lions. Upon tracking their prey, Coonhounds characteristically force the animal into a tree and alert their owners by waiting at the base of the tree and barking, or baying (an unmistakable hound howl.) With short coats and large webbed feet, the breed is made up of superb swimmers, while their versatile coat also allows for comfort in varying climates. The average size of Coonhounds varies based on variety, although dogs typically weigh in between 50-70 pounds. I have the pleasure of knowing quite a few Walker Coonhounds and must say that when treated well, these are fantastic family dogs as well as world class hunters. As a medium sized gundog, English Springer Spaniels are compact, quick dogs that are known for their ability to flush and retrieve bird prey. An attentive nature and friendly demeanor lend to ease in training the breed. Field bred English Springer Spaniels normally display medium length, wiry hair with wavy ears and some feathering along the legs and underbelly. Average weight of the breed ranges from 35-55 pounds, with an athletic build that lends itself to extended hunts in variable weather conditions. A strong willingness to learn, and playful demeanor make the English Springer Spaniel an ideal companion in the field and the backyard. Regardless of the hunting breed you love, or choose to own, remember that dogs are a long term commitment. Although certain breeds are prone to certain traits, all dogs require proper training and the dedication of their owners to thrive. When it comes time to bring a new pup into the house, consider adopting a pet from a local shelter or breed specific rescue. Purchase dogs only from reputable breeders in order to ensure the health of your hunting partner and long term protection of the breed. And at the end of every day, remember that to your dog you’re more than just a hunting buddy or his master. You’re his best friend, and he (or she!) is yours.